At Best Mattress, we simply love to pair our clients up with the best mattress to fit their needs. 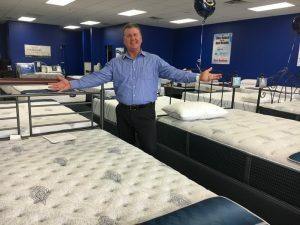 Although you might be able to find a slew of mattresses online, you won’t be able to test them out in person unless you visit a showroom, which is why we have so many locations throughout Las Vegas. To keep your brand new mattress safe, clean, and comfortable, we also offer mattress accessories such as mattress bags, stain guards, and even luxurious bedding. Also, because you will be working with a friendly representative who understands these accessories, we can help you to order products that will fit your new mattress perfectly—which can save you a lot of time and effort. Keep in mind that we also offer loads of valuable information online. Spend some time perusing this website to learn more about our brands, our financing options, and our commitment to quality. You can even pay your mattress invoice online or leave a comment for our manager. Our southwest Las Vegas store is located at 4120 Blue Diamond Road, Las Vegas, Nevada 89139. Look for us right between Target and Kohls. Also, because many of our customers visit us after they get off of work, we are open later than most of our competitors. We are eager to talk with you and help you find the best mattress you’ve ever had. John is a caring sales person who loves helping people find exactly what they need. Speak with this sleep expert that specializes in Serta, Simmons, Tempur-Pedic, & Five-Star brands. He knows all the details about Simmons products. Whether you are looking for a BeautyRest Black, Silver or Platinum, he is the guy. Serta’s Perfect Sleeper & iComfort definitely fall within his expertise. He can pair any brand with the adjustable base of your dreams at a low price with all the protective accessories that make your sleep the best! We also encourage our clients to visit us on social media to read about our products, services, and how we have helped people in the past. We have active pages on Facebook, Twitter, Google, and even Yelp. Check out previous reviews and feel free to leave your own. We look forward to meeting you!